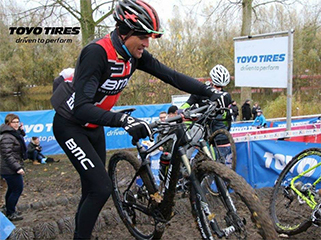 On November 26th, the third race of the cyclocross competition DVV Verzekeringen Trofee took place in Hamme. Toyo Tires was present as a partner of the event which was visited by more than 15.000 people. For this race, the cyclocross course was extended by the "Toyo Tires Trap". On a muddy, twisty and sloping terrain the man-to-beat, Mathieuw van der Poel, took again an early lead and fought for the solo victory at the Flandriencross ending before Wout Van Aert and Michael Vanthourenhout. As a result, van der Poel has beaten the World Champion van Aert and took the overall lead in the championship after three rounds. Sanne Cant (BE) came out on top at the Flandriencross in Hamme on Sunday but not without a challenge from Ellen Noble (USA) and Katie Compton (USA) , who finished second and third respectively. However, Katie Compton retains the overall lead of the competition. The next race of the DVV Verzekeringen Trofee will take place on December 9th in Essen.